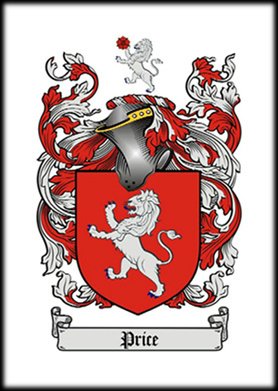 The ancient cognomen of the Price Family was styled "Ap-Rhys" ("Ap" being the prefix meaning "son of") which in the course of time was changed to "Ap-Ryce", "Apryce", "Pryce" and finally Anglicized "Price". At Rhylas, Wales, the descendants still live and spell their name Pryce. The Prices are a very ancient family and are descended in a direct line from from Marchwesthian, a famous Prince and Chieftain of the House of "Ap-Rhys" of Rhylas, North Wales, who served with great distinction with Gryffyd Ap-Cynam at the beginning of the Eleventh Century. The ancient home and country seat of the family known as "Rhuddlan Castle", has been in the possession of the family and has been the home of the Chieftains of the family from a remote period. In later times many of the descendants of this princely house distinguished themselves both in the State and upon the field. Sir Robert Pryce, Baronet and Knight, it appears by the old records, was crossbearer to Cardinal Wolsey, and was fifth in descent from Cedric Vaughn, of the line of Edward III, King of England. Various members of this family served in the office of High Sheriff Marshall of England, and Governor of the Tower, Master of the Horse, and many of the members espoused heiresses from among nobility, making the family rich and powerful. Sir Edward Vivian Price fought with the Crusaders under the gallant Richard Cour Le Lion in the Holy Land, and was knighted by him on the field of battle for bravery. Sir Henry Tudor Price fought at the Battle of Agincourt in the war with France. Many other members of the family distinguished themselves in the field of battle. They inter-married with the noble houses of "Howard, Duke of Norfolk", "Wylly", "Lenox", "Cardigan", and the Ap-Roberts of "Glynn du Wydd"- a son of whom, Sir Percival Glendale Price, became Baron of the Exchequer, and espoused to the beautiful Countess of Montrose. The family has always been distinguished for their high sense of honor, which they have always jealously guarded. The Lord of Gogerddan Castle went to battle with the English, accompanied by his son and heir, the young Prince. In the midst of the conflict the boy became frightened, ran from the field and returned home. His mother met him in the large hall, which was hung round with family portraits. She rebuked him and said, "Craven thou art, I had rather thou was't brought to me dead than that thou shouds't return a coward. Return instantly to thy father's side or renounce the name of Pryce forever, and forfeit thy mother's love. Gaze upon the face of thy ancestors, perhaps thou mayst gain courage and become a Pryce once more". The young man was overcome with shame at his cowardice and said, "I have no fear now. Kiss and bless me, my mother, and I will return to the battlefield- rejoin my father and prove that I am worthy of my name and to be called Pryce and thy son". The lad was slain on the battlefield and brought home dead to his mother, who upon seeing the body, cried in agony of remorse, "Oh, my son, my son, God forgive me". But the portraits on the wall seemed to smile, as if in approval of his heroic conduct. The Castle of Goderddan is very ancient and situated near Aberystwith, near Cardiganshire, Wales, and has been in the possession of the family for several hundred years, and their descendants who still dwell in the castle are a branch of the House of Ap-Rhys of Rhuddlan Castle, Rhylas, North Wales. Representatives of the Price Family can be found involved in most events shaping the settlement of the New World. It is the ancestors of Gregory Edwin Price, to whom this web site is dedicated. 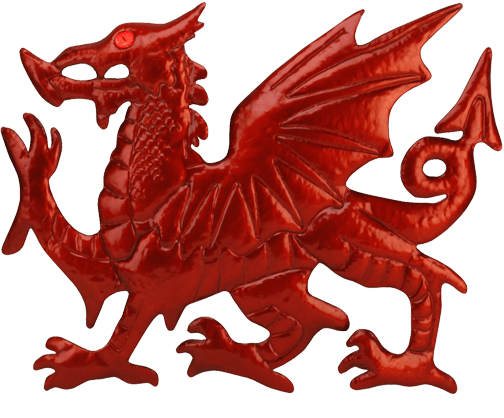 Price is a patronymic name derived from the Welsh "ap Rhys" meaning "son of Rhys". The given name Rhys means "enthusiasm" in Welsh.